As I’ve mentioned before, I really like Christmas baking. One of my favourite bits is a tradition that has developed of getting together with a few friends and baking Christmas cake together each November. The recipe came from my lovely mother-in-law, who still bakes several each Christmas, however we live in different states, so I started baking it myself so Mr Goldenpudding (Mr GP for short) wouldn’t miss out. 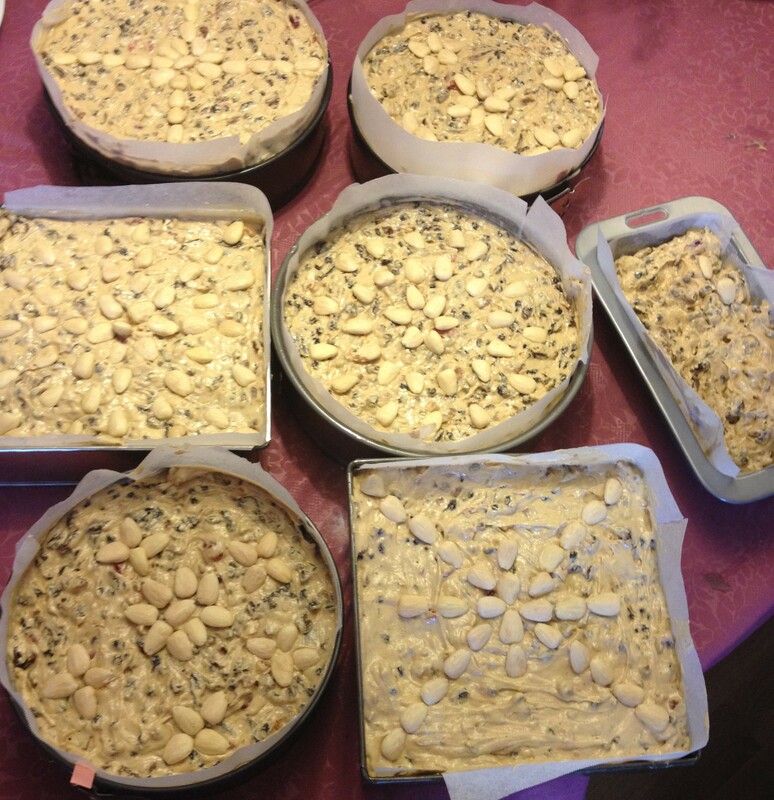 After making mini cakes for friends one Christmas, there were many requests for the recipe, and somehow, we ended up getting together to mix up a big batch. Every year since 2008 we’ve repeated what has now become a lovely tradition, getting together to chat, have a glass of bubbly, and going home with one of these cakes. This year there were six of us, hence the huge bowls of soaking fruit to make a batch six times the recipe below! I have to also add, as any other stand mixer fans will appreciate, that I get a ridiculous sense of satisfaction watching my machine effortlessly charge through a bowl of 1.5 kg each of butter and sugar! This is a really rich and delicious fruit cake, and would probably be quite tasty with any fruit, but if you’re going to the bother, I think it really deserves great quality fruit, so I use lovely Australian sultanas, raisins and currants, and preferably French or Italian glacé fruit (I would happily buy Australian, but it’s almost impossible to get now – if you have any sources, please let me know in the comments!). Do you have a special cake you make every Christmas? Chop glacé fruit and ginger roughly, halve cherries, and slice dates. Combine all fruit in a large bowl and stir in brandy. Cover and leave for a week, (or more) stirring every couple of days. When ready to bake, preheat the oven to 125C. Grease and line a 23cm (9”) square pan or similar. Stir together the flours and spices and put aside. 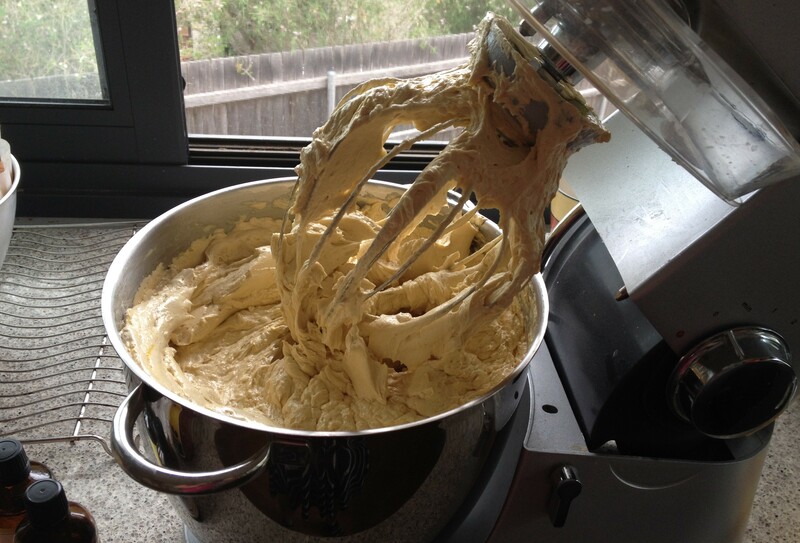 Cream the butter and sugar (preferably in a stand mixer) until pale and fluffy. Beat in the eggs one at a time, followed by the jam and essences. Using a wooden spoon, stir in 1/2 of the flour, followed by half the fruit, the second 1/2 of the flour and the other half of the fruit with any remaining liquid plus almonds if using. 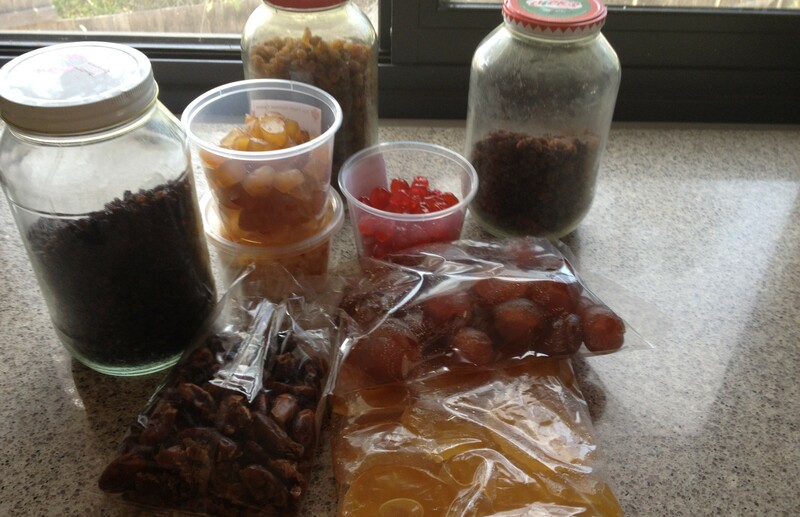 The mixture will be very heavy and difficult to stir, so feel free to use your hands if needed! Scrape the mixture into the pan and level the surface. Decorate with blanched almonds in any pattern you like. Put in the preheated oven and cook for at least 3 hours. I start testing at three hours, but it can take up to four. Cover the cake with foil if it starts to brown too much. Once the cake tester comes out clean, remove the cake and put the tin on a rack to cool completely. If you like, you can carefully spoon a couple of tablespoons of extra brandy over the warm cake. Once cold, remove from the tin and store in an airtight container for as long as you can make it last! I suggest leaving at least a week before eating, but it will continue to improve for a couple of weeks, and will last for months. Oh my! The sight of all those cakes and the context you create for us of women friends creating them amidst laughter and bubbles bring tears to my eyes. This calls for a special collective noun all unto itself, like “an exaltation of larks” or “a parliament of owls”. How about “a cornucopia of cakes”? Too corny? Thank you, Beck, for sharing with us the special richness of food, friendship and ritual. thank you Paradiva, I hope to have many more such moments throughout Christmas! Sure, and if you want a cake sooner than that, I usually make more than one each Chrissie anyway, cause Mr GP loves them too, so you can come and make one with me…. 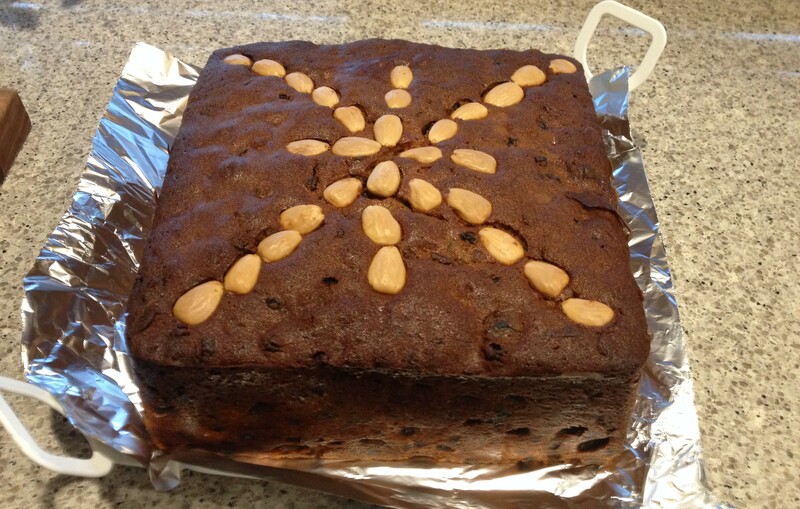 I love Christmas cake, this January I had to make another one because I missed it once we’d finished the first one. 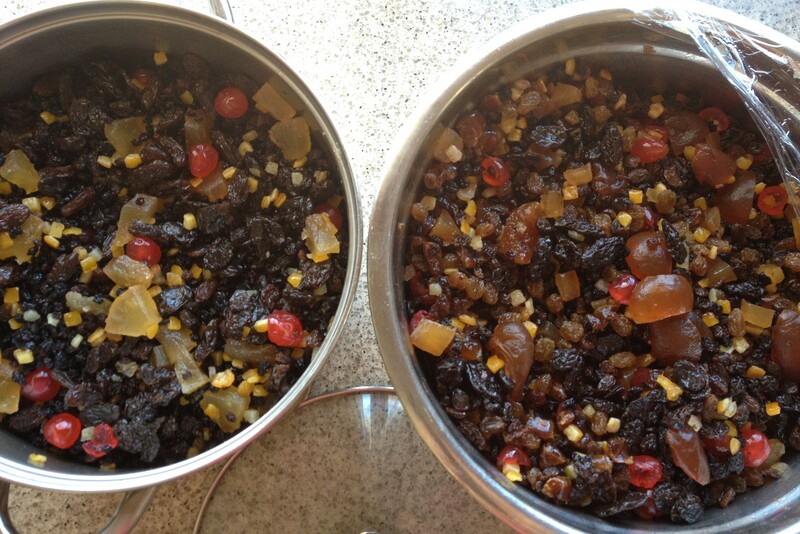 I say we but actually I am the only member of my family who likes Christmas cake so what does that tell you…. Dear goldenpudding, I love your blog and I am touched by your comment about your mother In law. Lots of love and happy baking your mother in law. I have learnt so much from you.